Wallis Simpson loved King Edward VIII – the sovereign who abdicated to marry her, rocking the foundations of the British monarchy – she adored opulent jewelry almost as much. And to seal the 20th century’s most scandalous love affair, the royal lavished gems on the bewitching American – whose two previous divorces made it impossible for him to have her hand and stay on the throne. One of the most personal items is the bracelet Wallis – styled the Duchess of Windsor – wore on their wedding day. It featured gem-encrusted crosses, engraved with inscriptions marking key points in their romance. One recorded her appendectomy, while another reading “God save the King For Wallis”, refers to an assassination attempt on Edward. Another, with the words “The Kings [sic] Cross” marks the time in 1936 that, after a heated argument, she hailed a taxi and said “King’s Cross,” to the driver. “I’m sorry lady,” he replied. It sold for £601,250 when the Duchess’ collection was sold at auction in 2010. Another standout piece which was often seen on the Duchess’ wrist at parties in the Riviera, where the couple made their home in exile, was this spectacular onyx and diamond bracelet. Made in 1952, it was based on sketches of the big cats at the zoo in Vincennes, France. It fetched £4.5 million at auction – three times the amount at which it had been valued. Eve Alfillé has been inspired by animals and nature in her jewelry design. When she saw this Madagascar jasper she remembers thinking “It looked like flight!” When designing this piece she thought of it having “strength and fragility” at the same time. On one side there was a yellow dot that wasn’t repeated on the other side so Eve decided to add a yellow diamond so the two sides would match. Then she thought the thorax should be a degradation of diamonds of every color. “Of course this butterfly is a female with an egg.” States Eve. The result is an exquisite butterfly that is ready to fly! This butterfly with Madagascar Ocean (Orbicular) jasper wings. Head & body: suite of graduated marquise natural-color champagne, golden-yellow & white diamonds total 0.47 carats. Hand-fabricated pin with platinum tendrils and 18 karat gold. 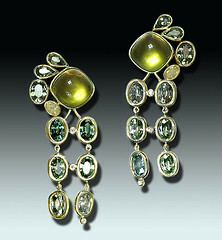 White, yellow, champagne and irradiated green diamond “dewdrops” total 0.23 carats. Suspended champagne diamond briolette (0.57 carat) removable drop. $10,200. 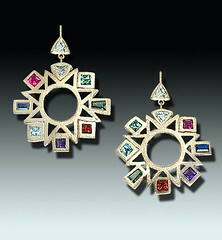 Elizabeth Taylor was used to receiving dazzling love tokens. But the 50.6-carat ‘La Peregrina’ pearl, given to her by Richard Burton, left all others in the shade. 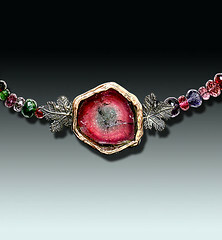 He bought it for the actress as a Valentine’s Day gift and she later comissioned Cartier to design a ruby-and-diamond necklace mount for the piece. It went for a $11.8 million (£7.6million) at auction – almost $9 million more than expected. The pearl’s fascinating history fuelled the fierce bidding battle. It was given to Mary Tudor of England upon her engagement to Spain’s Phillip II in 1554 and belonged to a succession of eight Spanish kings until 1808. When Richard bought ‘La Peregrina’ at auction in 1969, it found a home with Hollywood royalty. Not that his wife always looked after the precious stone that carefully. Elizabeth once misplaced the stunning piece which was eventually found in the mouth of her beloved dog after an extensive search. Eve has also found unique beauty in the rare abalone pearl. The most colorful of all pearl-producing mollusks, abalone, are found in rocky, coastal waters around the world. Though fairly plentiful, these rock-hugging snails rarely produce pearls. These snails are fast moving and muscular and a pearl might form for as many as 10 years. This pearl was acquired from the famous pearl doctor, Lowell Jones. This romantic “Calla Lily” lustrous rare natural abalone pearl and platinum pendant is an Alfillé masterpiece. Art nouveau inspired platinum caresses the curves of this iridescent “Opal of the Sea”. The 14.40 carat abalone pearl is studded with emeralds, diamonds and natural alexandrite to echo the colorplay within the pearl. Twelve emeralds total 0.18 carats, thirty-one diamonds total 0.31 carats (F-G/VS), a 0.06 carat pink irradiated diamond and a 0.20 carat natural alexandrite. Eve states that this piece is “Beauty that takes risks”, commenting on the fragility and uniqueness of this pearl. $12,800. The very first sparkling gift Richard gave to the screen icon was the 33.19-carat Asscher-cut Krupp Diamond, which he bought for her in 1968 and had made into a gorgeous ring. It had formerly been part of the estate of Vera Krupp, second wife of the steel magnate Alfred Krupp. One of her favorites, Elizabeth wore it in a number of her films – in fact, it was hardly ever seen off her finger. It sold for $8,181,500 (£5.6million) in 2011. Eve’s “Bacchanal” ring is a celebration of life! Eve loves creating celebratory rings as well as seen in her “Bachanal” ring from her “In Great Spirits” Series. Elizabeth Taylor would have loved this ring! Rare plum and raspberry colored spinels mimic merlot and pinot noir. She doesn’t forget the chardonnays and pinot grigios on the side with her two lemon yellow Montana sapphires. The cast and finished 18 karat white gold shows leaf and fruit carvings on the front and back of the ring, each side set with two lemon yellow Montana sapphires. The top of the ring features fine spinels: one 12.38 carat plum-color cushion cut spinel, two raspberry cushion-cut spinels totaling 3.50 carats and four cushion-cut pomegranate spinels totaling 6.40 carats. As if that weren’t enough opulence, the head of the ring is surrounded by 30 glittering diamonds totaling 0.82 carats (E-F/VS). $14,800.